Today is World Hepatitis Day, an annual event started by the World Hepatitis Alliance in 2008 to raise awareness about hepatitis in order to better prevent its spread and improve treatment and access to treatment. Hepatitis B and C are part of a broader “syndemic” of intersecting and mutually sustained problems that also include drug abuse (especially injection drug use), HIV and other infectious diseases, mental illnesses, and social dysfunctions, including stigma. All of these conditions interact, and addressing them comprehensively is essential if we are to combat hepatitis successfully. These overlapping and synergistic conditions create a “perfect storm” that demands coordinated responses by the public health community, which is mobilizing to meet this challenge. Hepatitis is not a new problem for people who abuse drugs. In fact, 60% of newly infected individuals are people who inject drugs (PWID). NIDA has been supporting research on hepatitis for many years; our early work in the late 1980s helped identify the hepatitis C virus (HCV). Currently we have multiple studies targeting hepatitis, including the largest single project focusing on HCV, HIV, and drug use—the International Collaboration of Incident HIV and Hepatitis C in Injecting Cohorts (InC3). And this past week, the journal Clinical Infectious Diseases published an issue devoted to hepatitis C prevention and treatment in PWID, featuring the work of many NIDA-supported authors. Recent research has also helped explain the role of differentially regulated gene expression in HCV clearance (which allows people with these particular genes to clear the virus on their own, without medications). Understanding how this genetic profile protects against chronic HCV infection will help inform the development of more effective treatment strategies. But much work remains to be done, particularly in engaging and maintaining people infected with HCV within the treatment continuum. 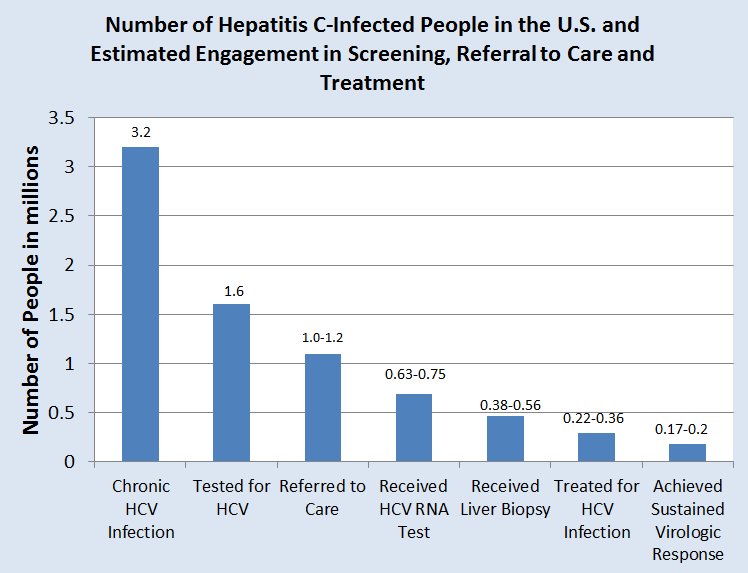 HCV screening and linkage to care should be made widely available in all treatment settings, from the offices of personal care physicians to opioid treatment programs and any other local clinics and community based organizations, so that all populations—especially the most vulnerable—have access to the care they need. In designing HCV prevention, it is crucial that we no longer assume (as people did for many years) that HCV can be prevented through the same strategies that work in reducing HIV risk among drug users; the diseases are different, and syringe-cleaning practices useful for HIV are inadequate to prevent the spread of HCV. We are poised to make significant advances in reducing the burden of viral hepatitis. Scientific research has led to the development of new medications that are easier to tolerate, require shorter treatment regimens, and virtually eliminate the virus. Several more are in the development pipeline and, once approved, could dramatically reduce the devastating consequences of chronic viral hepatitis infection, so long as they reach the populations that need them. NIDA. "World Hepatitis Day." National Institute on Drug Abuse, 28 Jul. 2013, https://www.drugabuse.gov/about-nida/noras-blog/2013/07/world-hepatitis-day. NIDA. World Hepatitis Day. National Institute on Drug Abuse website. https://www.drugabuse.gov/about-nida/noras-blog/2013/07/world-hepatitis-day. July 28, 2013.